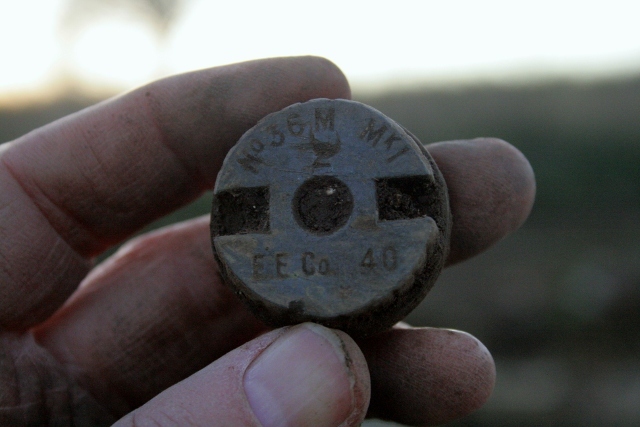 Looking S at Newmarket Farm Cottage site. 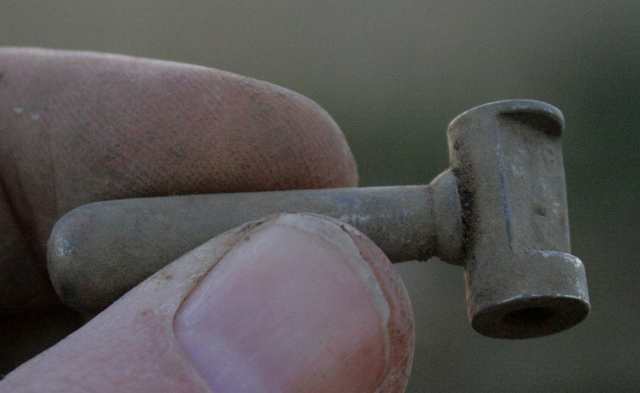 A cold but mostly sunny day with nice finds. 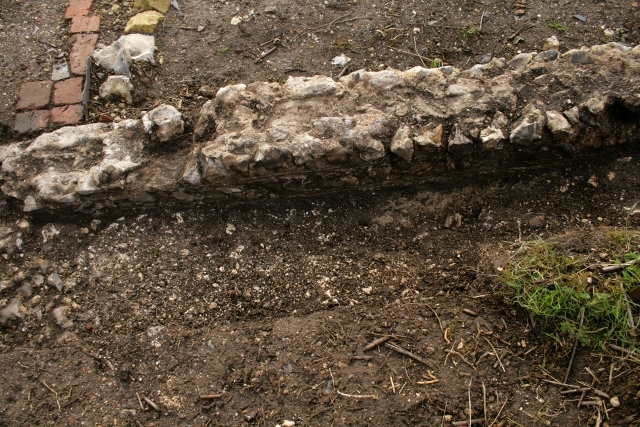 The west wall of the cottage was cleaned up sufficient to outline at least the top of its outer face. 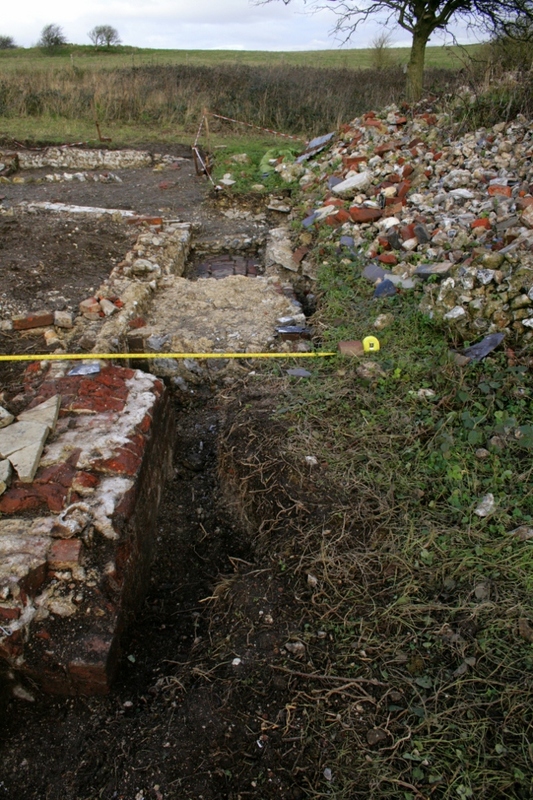 Looking S at cobbled surface N of garden gateway with brick paving on W path edge to S.
Looking S at W side of garden gateway and N side of N boundary wall. 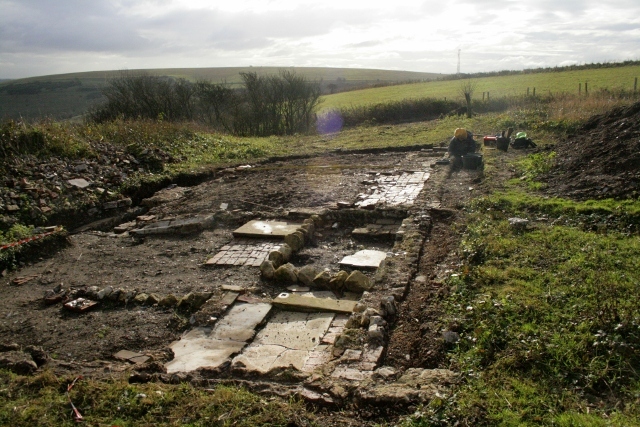 Last week’s excavation and cleaning of the western half of the front garden gateway and north boundary wall was also now recorded photographically; we hadn’t managed to do so previously because of rain. Looking S at E side of cottage. Looking N at E side of cottage. 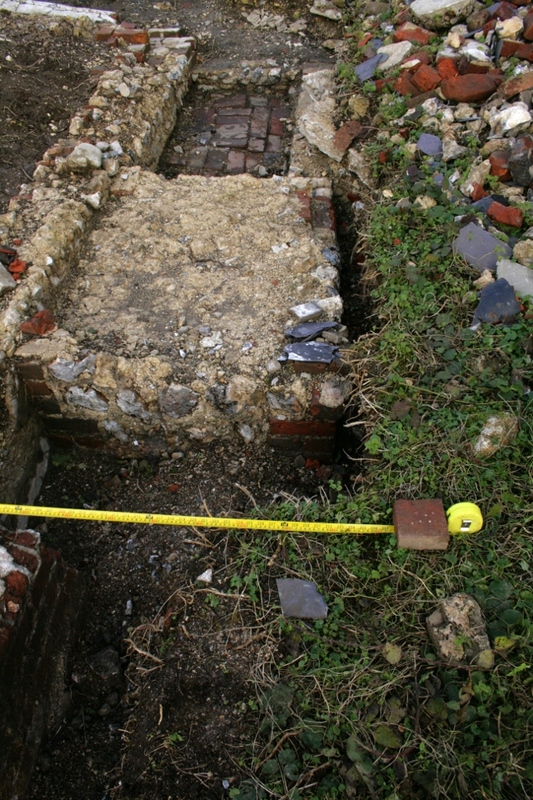 Looking N at E side of cottage (brickwork bottom left is the base of the chimney breast. 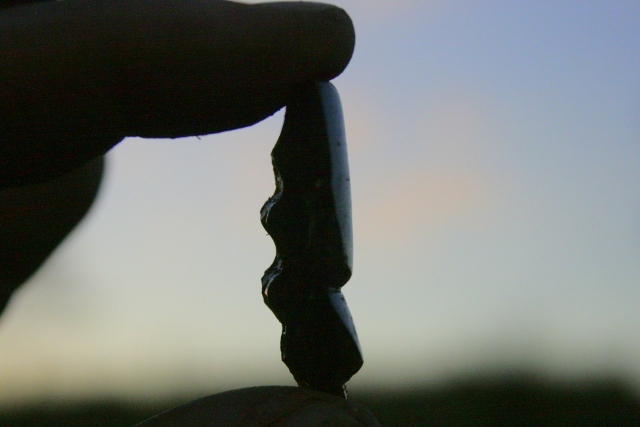 Newmarket Farm Dig – end Nov 2013; (structures shown are only approximate +/- 20cm). 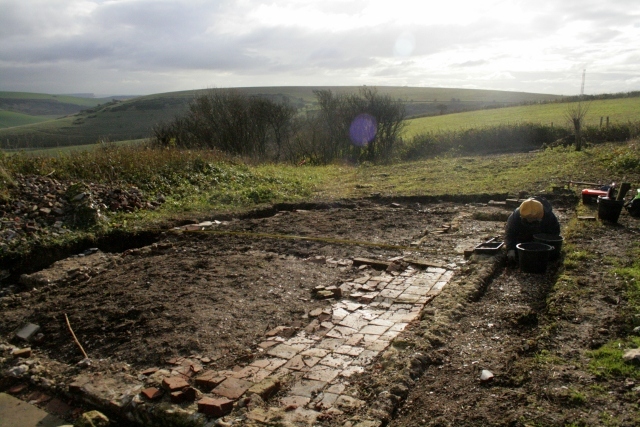 Base plan from East Sussex Record Office. 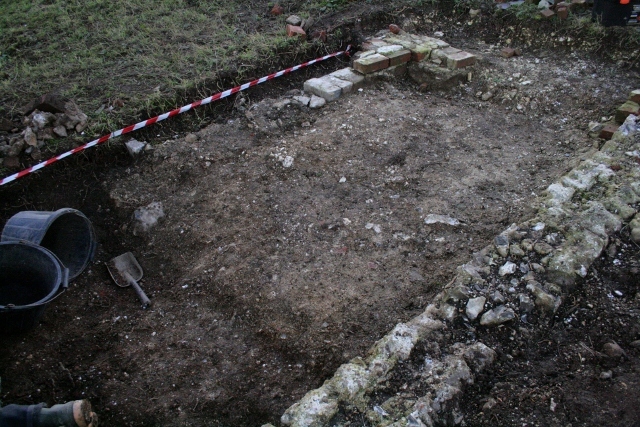 and back round the southern end of the cottage, a little under 2 metres south from the outer face of the south wall of the cottage (an area which has now been completely excavated apart from the very far south-east corner of this area; since no features are expected in this latter area, the southern most 1.5 metres of this corner will be left till last). 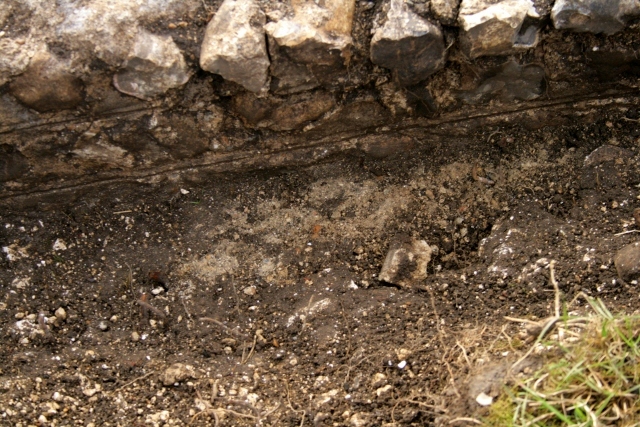 and the narrowest possible trench extension, about 0.5 metres wide and 4 metres long, down the southern half of the east side of the cottage to discover the depth of the original ground surface and to completely clean up the base of the last (only partially excavated) section of the cottage walls). 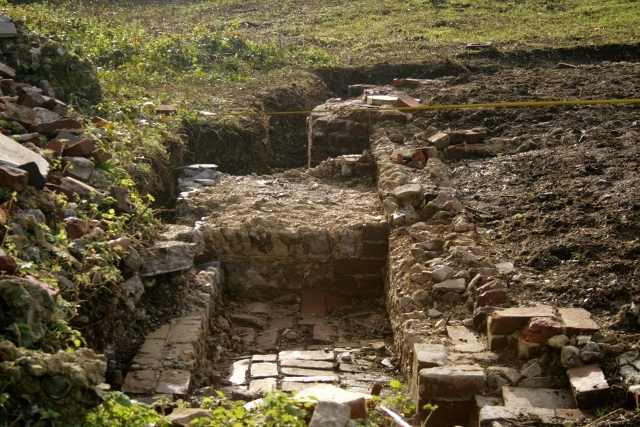 Looking SW at extension at S end of cottage. 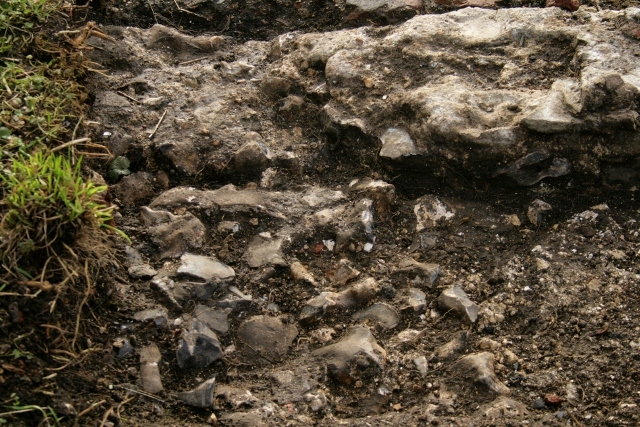 Looking SW at excavation of area E of extension, S of cottage. 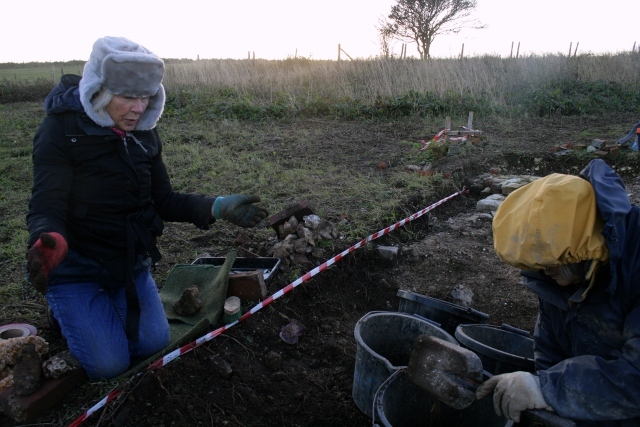 The trench across the western 2/3rd of the area to the south of the cottage, started before the guided tour, was further excavated. 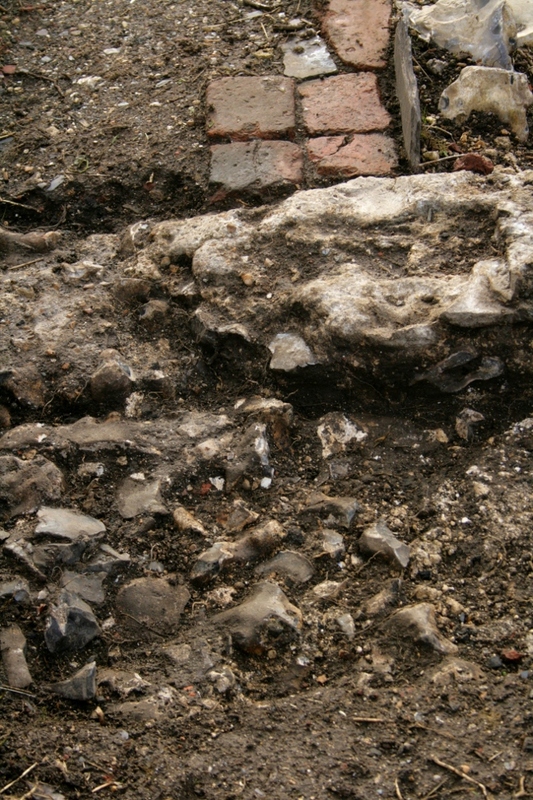 In particular, this was most of the area immediately to the east of the remains of the ~1880 lean-to extension. 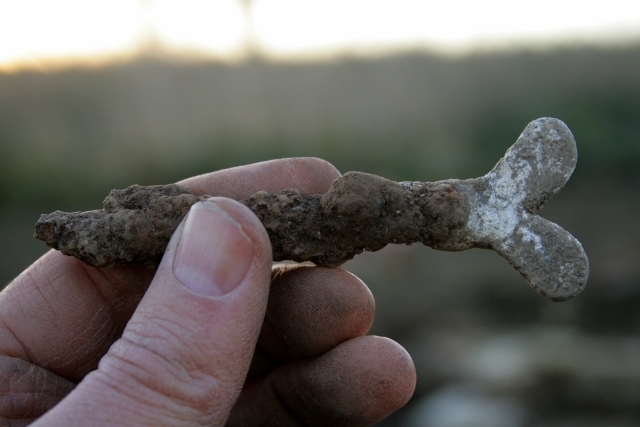 The solid zinc screw base of a mark 1, No 36M ‘mills bomb’ (hand grenade) found was yet more evidence of the WW2 training which was responsible for the complete destruction of the cottage, barns and perimeter walls during the latter half of the war. 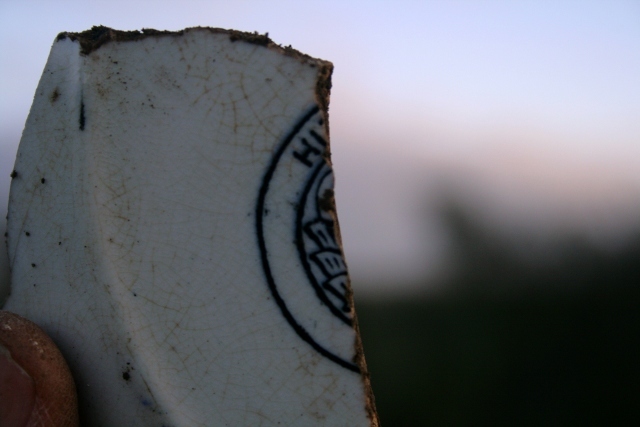 Part of pottery mark for ‘aesthetic movement’ plate. 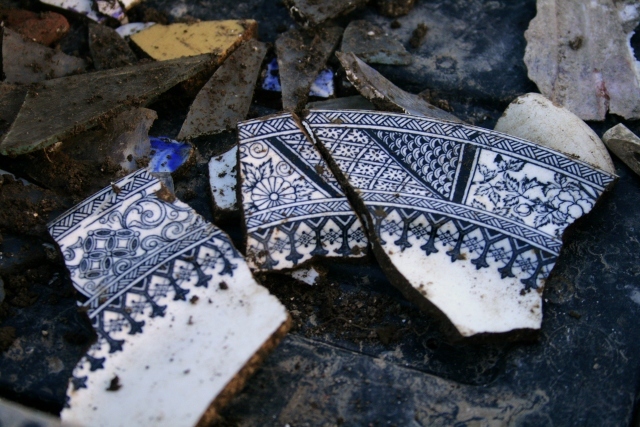 Shards of the ‘aesthetic movement’ design plate. 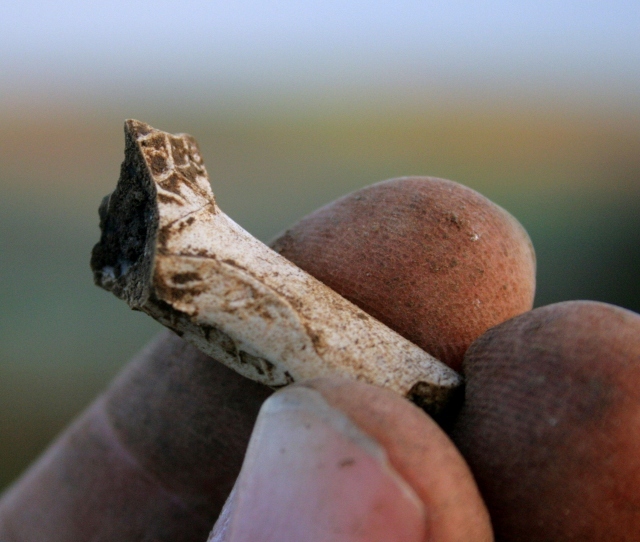 Decorated clay pipe stem fragment. 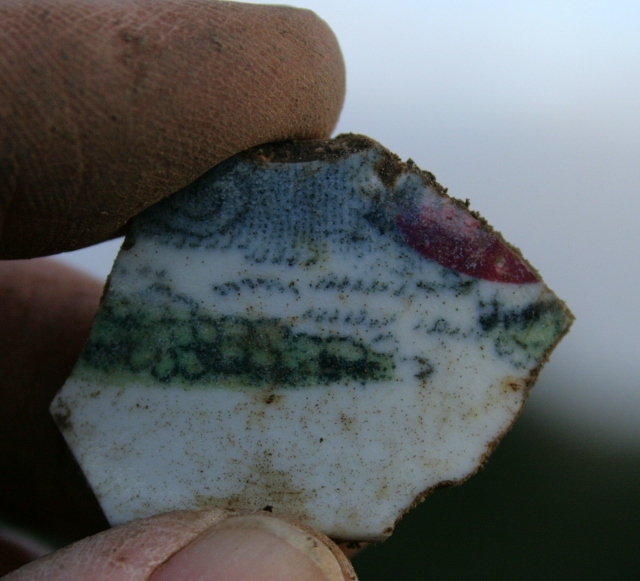 Some amazing finds had previously been excavated from this area, but whilst nothing exceptional was found today, some very nice ceramic shards and intriguing metal objects were excavated.